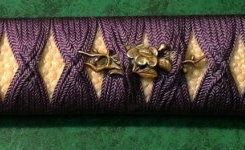 This is the second tsuka that I did for the fine gentleman / collector in San Francisco. I did this in the Jabara-ito style using 8 purple colored silk threads. This style of wrap takes longer than normal because of the both the weaving patterns of the threads, as well as the number of threads involved. I shared this with a couple members of our local Token Kai, and I was asked to bring it to our next meeting as the focus of that evenings discussion - quite an honor.